Raymond Walter Emlyn Jarrett was born in Aberconyn, Wales on 26th November 1911 and attended Mountain Ash County Secondary School, Glamorgan. He joined the RAF in September 1927 as an Aircraft Apprentice and passed out in August 1930 as an AC2 Metal Rigger. On 4th July 1935 Jarrett remustered as a u/t Fitter, becoming a Fitter Class 1 on 30th July 1936. He was promoted to Corporal Fitter on 15th March 1937. Jarrett again remustered on 23rd June 1937, this time as an Air Observer/Fitter. Promoted to Sergeant on 19th January 1939, Jarrett remustered as a u/t Pilot on 6th February. After completing his training he joined the newly-reformed 245 Squadron at Leconfield on 6th November 1939. The squadron became operational with Hurricanes on 25th April 1940. Soon after the German blitzkrieg was launched in France on 10th May Jarrett went over with ‘A’ Flight of 245 to reinforce 615 Squadron. After what he described as ‘eight of the longest days of my life‘ Jarrett found himself at Abbeville, on an aerodrome crowded with Hurricanes, Lysanders and Blenheims. He was the last pilot to take off, on 22nd May in a Gladiator, with orders to ‘land anywhere in England‘. Jarrett put down at Little Rissington and was put under close arrest but was released when a signal came ‘Sergeant-Pilot Jarrett in one Gladiator to report to Kenley‘. The CO at Little Rissington gave Jarrett two days grace and the use of his own staff car to visit his wife, who was teaching at Shipton-under-Wychwood. Jarrett duly flew his Gladiator to Kenley. When he could not find anyone willing to take it on charge, he left it at dispersal and went to rejoin 245 Squadron, then at Drem. In June 1940 the squadron moved south to Hawkinge and on the 20th it made a strafing attack on the aerodrome at Rouen-Boos. Jarrett was credited with destroying five transport aircraft on the ground. 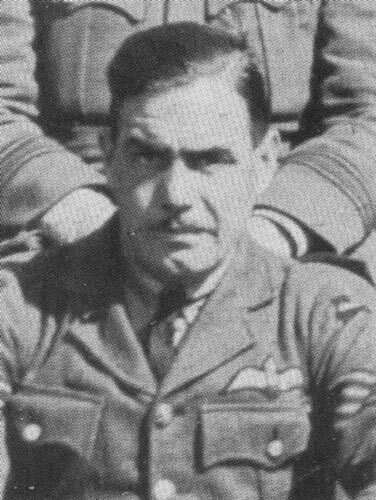 501 Squadron – He was attached to 43 Squadron at Usworth in early September 1940 and then joined 501 Squadron at Kenley later in the month. On 15th October Jarrett’s Hurricane, P5914, was damaged by Me109’s in combat over Sheppey. He made a forced-landing at Rochford, wounded. Jarrett was made a Flight Sergeant on 1st April 1941, a Warrant Officer six months later and he was commissioned as a Flying Officer on 6th April 1945. He retired from the RAF in April 1946. He held an RAFVR commission briefly in 1950 and was then commissioned in the Royal Auxiliary Air Force Regiment for five years from 26th August 1950. Jarrett later went to live in South Africa and he died in Durban on 10th August 1984.